That Escalated Quickly: Street or Cage... "We Are Fighting on Sight"
Discussion in 'UFC Discussion' started by ReadWrite, Apr 3, 2019. Should Leon just let it go? “That’s just facts. I don’t need to put on a persona. I’m talking facts. It’s not trash talk. 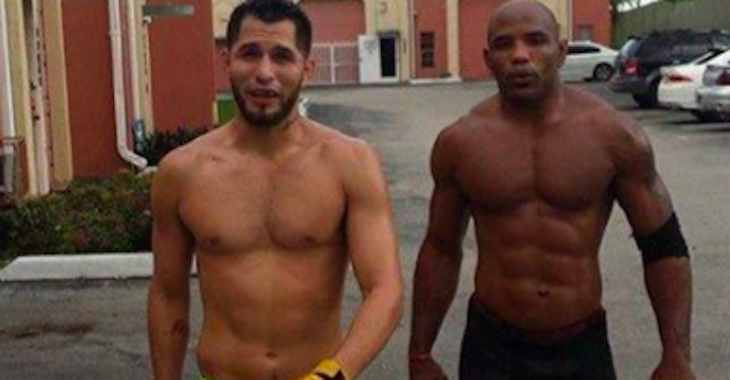 This fight [with Masvidal] has to happen. If I see him on the street, it’s going to happen or it’s going to happen in the cage. But either way, we are fighting, no matter what, we are fighting on sight. I can understand if hes mad but he will eventually get a chance to get his revenge on Masvidal. If Leon gets ranked high he can call out Masvidal and they will fight if Masvidal doesnt wana fight him now. Kenny Powerth and Pakman like this. This will end up being the highlight of Edward’s career. submerged88, bananaeyes, billiam and 12 others like this. Paulsp, BlastoiseDad, Alanf7 and 4 others like this. Wait, I thought they already fought on sight and this guy got punked. Chucky, Alanf7 and A.S. Deep like this. One guy cheap shot the other guy and security broke them up. Kenny Powerth and IngaVovchanchyn like this. Maybe but I don't think I'll ever bet against Mas again. He hurt me bad that night. Real bad. Leon was trolled into a trap. He is not a street fighter. Cheap shot? That was def no cheap shot. But yes, it did get broken up by security, and Edward's did his best to act like he wanted the security to let him go, while he went from being loud and talkative, to completely silent within seconds. Real question is.. what Has Edward's done to to think he deserves an actual title shot? And if he says the fight will happen on sight, then why act like he wants it in the cage, being they would have to see each other prior to the fight. Kid is delusional it appears. Punching someone who isn’t ready for a fight is a cheap shot. Yes. Of course. Mas knew he was safe and security would not let him get stomped by Leon and his team. seak, Lax617, Kenny Powerth and 1 other person like this. I think he does need to fight Masvidal next time he sees him. I also thinks he loses any street fight against Masvidal, his best bet is to try to get Masvidal in the cage. I respect him keeping it real. Honestly, I surprised more fighters don’t have this mentality. You hit me in the face backstage after a little trash talk - it’s going down. I’m with Leon. The one thing I don’t agree with is that he deserves a TS.